annie grace: Yes! That Is A Score Board!!! Yes! That Is A Score Board!!! That is me... 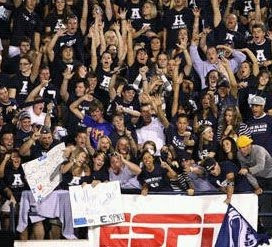 The one right in the center, second row, with my arm in the air pointing #1. Yep, USU killed BYU! Thank god! First time in 17 years! anddd I was on ESPN for it. Feeling VERY proud of my Aggies!